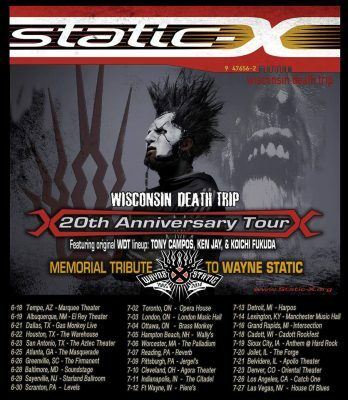 Earlier in 2018, the original surviving members of the band Static-X announced a reunion tour and album, in memory of the deceased Wayne Static. He passed away in November 2014. The reunion consists of a brand new album titled Project Regeneration. The music is reworked by the original lineup, with vocals from leftover sessions before Wayne passed away. The members of the lineup includes bassist Tony Campos, guitarist Koichi Fukuda, and drummer Ken Jay. Former prominent members Nick Oshiro and Tripp Eisen will not be involved. In addition to the album, a reunion tour celebrating Wayne and the release of the debut album Wisconsin Death Trip was announced. Just a few days ago, the tour dates for the trek was announced. It consists of 30 dates nationwide (and 3 dates in Canada). The bands DevilDriver and Dope will be the supporting acts. DevilDriver is led by frontman Dez Fafara, former vocalist for Coal Chamber. This tour is notable for the fact that DevilDriver will also play Coal Chamber songs in their setlist, on select dates only. Their newest album is titled Outlaws Till the End and came out in July of 2018. Dope‘s upcoming album is titled Blood Money, Part 2. Although there was a brief reunion of older members last year, the current lineup consists of frontman Edsel Dope and 5 newer members that have only been in the band for the past 2 years. “Fun” fact: Wayne Static passed away in November 2014. The Gathering of the Juggalos was held in July 2014. Wayne Static and his backing band performed at the Gathering, about 3 months before his passing; thus, anyone that was at the 2014 Gathering witnessed Wayne Static‘s final performance of his life.